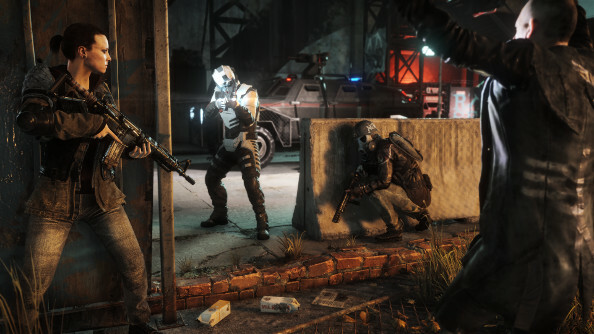 Like its protagonists, Homefront: The Revolution is an underdog. It suffered through development and publishing hell, with the IP changing hands twice, and the original dev team at Crytek UK being laid off before most of them were taken on at current developer, Dambuster Studios. 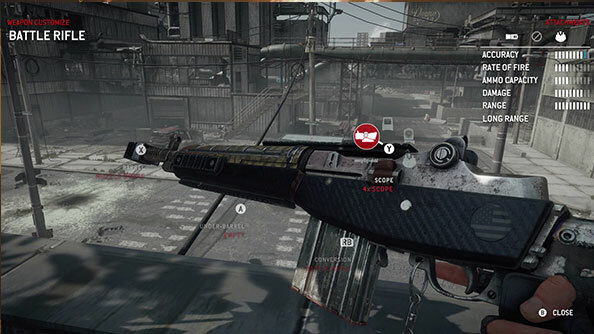 Like any good revolutionary force however, Homefront’s developers hunkered down through the tough times, and kept chipping away at the game even when it was on the brink of extinction. After more up-close-and-personal shooters? Check out the best FPS games on PC. It’s an open-world first-person shooter in which a reunited Korean army (KPA) has invaded the US, and you must rouse the oppressed population into the titular revolution through your heroic actions. 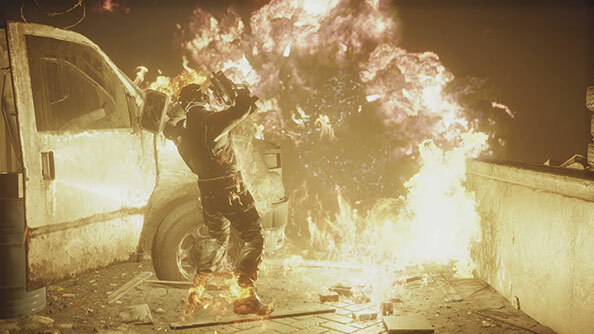 Again, the plot mirrors reality, as Homefront has its work cut out in winning over the hearts and minds of a videogame audience firmly entrenched in the FPS status quo. Having played the game for a good half-dozen hours, I’ve found several distinguishing features that should make us, the gaming audience, stand up and take note. And here they are, in easily digestible list format. 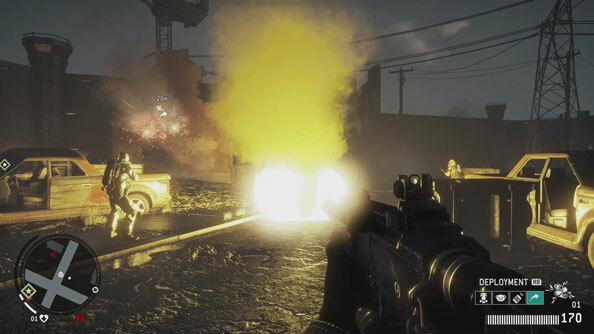 The game takes place in Philadelphia, a city divided into several KPA-controlled districts, each of which is either a red, yellow or green zone. You take these over by winning ‘Hearts and Minds’, which are earned by setting up rebel bases, tuning in radios, taking out enemy patrols, and numerous other subversive actions. What’s interesting about this setup is that each zone forces you to play differently. For example, Yellow Zones are heavily-controlled ghettos for the Philly populace, where you stealthily perform assassinations, take out loudspeakers, give money to the homeless (you good Samaritan, you), and infiltrate outposts. As I fomented disorder in the yellow districts, I found it hugely satisfying to see the people steadily grow in confidence, get unruly, tag walls with graffiti, protest, and eventually take up arms against the oppressors. If you’re feeling in more of a ‘warzone’ mood, then get yourself out to the red zones, the site of all-out urban warfare between the KPA and rebels. Here, it’s a simple case of using fighting alongside your comrades to turn the red map blue. Roaming these here parts, there’s a sense of perpetual conflict as skirmishes break out all over the map, though I did feel that the devs missed a trick by not having a constant back-and-forth of territorial invasions, which would’ve created a greater sense of a persistent, living world. According to mainstream shooter logic, there’s no better remedy to being riddled with bullets than by sitting down behind a piece of cover and counting to five. Once you’ve done this, the blood splatters will fade from the edges of your screen and colour will be restored to the world. Things aren’t so simple in Homefront. While you have a limited supply of quick-fix healing injections, these are far from ubiquitous, and if you find yourself in a warzone with low health, you’ll need to scavenge for health packs in bombed-out buildings or seek out rebel bases to get stocked up. And don’t go thinking that the cans of tinned foods you find in the world will replenish your health either. This isn’t Wolfenstein after all… or Popeye. Not only do your bulletholes not heal up over time, but even on the default difficulty setting (appropriately labelled ‘Hardened’), it doesn’t take a lot of damage for you to start bleeding out on the ground. This means that charging out into a group of enemies while screaming ‘FREEDOM’ is never the best course of action, fun though it undoubtedly is. I regularly found myself pinned down and having to rely on the cover provided by the urban ruins. Each time I decided to make a zigzagging run across the street while a KPA vehicle was searching for me, or between a couple of bombed-out cars, I got a pleasant rush knowing that if I got spotted, I’d probably die. In order to survive, I had to take potshots at the enemy, wait until their return fire died down, then change cover, or even retreat if necessary. 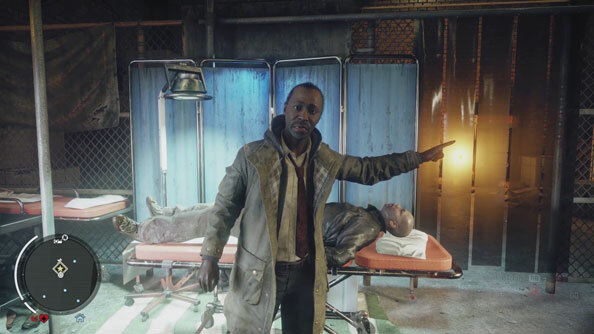 It’d be stretching it to call Homefront a ‘realistic’ shooter, and it certainly allows for moments of spectacular Hollywood heroism, but it does a great job of making you feel at a constant disadvantage next to a superior force. Too many games in general present death as something inconsequential – an arbitrary marker that you’ve failed, but it’s ok because you can just restart from almost exactly the same spot as you died and keep banging your head against a problem until you smash your way through it. To make you feel the weight of death, Homefront takes the BioShock Infinite approach of charging you a small penalty each time you die. From my plentiful experiences of dying in Homefront, I can confirm that you lose a substantial portion of the scavenged goods (which you offload to traders for money) on your person at the time. Sure, it’s not a Dark Souls-style ‘scream in anguish each time you cark it’ penal system, but at least you’ll pause for thought before you engage the enemy next time you enter the fray, making you a better guerrilla fighter in the long run. Many shooters play to the fantasy of casting you as a gifted, bullet-sponge capable of turning the tide of a conflict single-handedly – from the gung-ho antics of Doom Guy to the preternaturally gifted, drug-fuelled heroes of the Far Cry series. Not so in Homefront, which forces you to carefully survey the field before attacking (or indeed deciding that in a given situation, it’s best not to attack). Sneaking around a Yellow Zone, for example, attempting to take out heavily-armed vehicle patrols head-on would be a suicidal venture, because there are no armed rebels to back you up. Instead, you should focus on small-scale tasks like assassinations or, if you do decide to bombard a patrol with homemade explosives, be prepared to run for your life and find a bin to hide in as squads of KPA descend on the area. Not exactly glamorous, but certainly fitting for the tone of the game. In the hostile red zone meanwhile, an ill-judged skirmish can quickly deplete your scarce supplies of ammo and health kits. Much like a real guerrilla, you must pick your battles and strike with pre-planned precision. Eagle vision, drones, infinite sprinting? Bah. 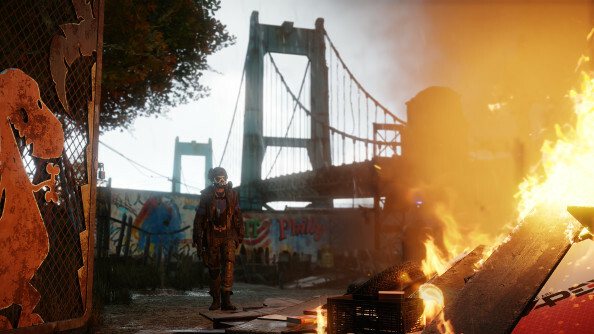 Forget about all these mollycoddling luxuries in Homefront: The Revolution. You are, after all, a desperate freedom fighter, not the spandex-clad star of a Marvel comic. While your character doesn’t gain any otherworldly internal abilities that tap into some latent ‘gift’ in his DNA, you do earn various upgrades as you progress (though nothing nearly as fancy as possessing owls to do your bidding). During my hands-on, I picked up some lighter footwear that reduced the sound of my footsteps, and some better clothing that made me capable of faster crouch-walking. You’ll also have access to the usual assortment of weapons upgrades, though Dambuster have made the curious design choice to not let you loot weapons from enemies (explained by them being programmed for use only by the KPA… or something). Even in its current state, Philly isn’t the most photogenic of places – more of a cool, gritty urban sprawl than a ‘Wish you were here’ postcard city (with the notable exception being the legendary ‘Rocky Steps’ at the Philadelphia Museum of Art). As you can imagine, after the KPA invasion things only got worse, leaving Philly a bombed-out, skeletal wasteland that makes the world of Fallout 4 actually look kind of lively. In Homefront, there are no baseball stadiums inventively reappropriated for people to live in, or nightclubs set up in underground tunnels. This is a freshly ruined world with a heavy aura of hopelessness, that at moments has echoes of the excellent Metro games (though admittedly matching their morose atmosphere is a big ask). The bleak setting emphasises Dambuster’s determination for Homefront not to be awash with silly stylisations or Hollywood cinematics. It’s grim starting point, however, means that you get the satisfaction of seeing it revived with hope as you lead the good fight. Make no mistake, Homefront has a tough battle ahead to win over audiences entrenched in more big-name prestigious shooters. 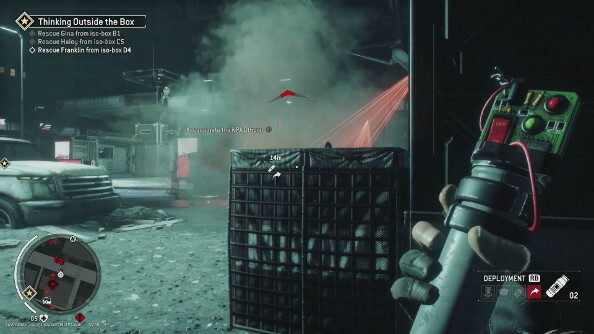 With less forgiving gameplay than its mainstream rivals, Homefront clearly aims to be different, though its reliance on the base-capturing, ‘make the map your colour’ formula present in better-known games may undermine its ambitions. 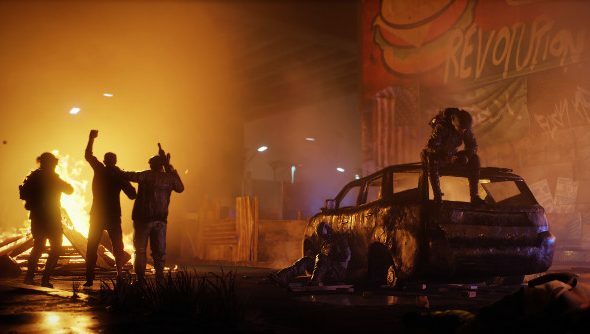 Homefront: The Revolution hopes to be an upstart, but it’ll be a few months yet before we find out whether its insurgency will shake up the hegemony or fizzle out like so many before it.